Thermo Fisher Scientific premiered three new systems on the Orbitrap™ platform that will reportedly position it to compete in the QTOF market. The Orbitrap Velos Pro™ linear ion trap incorporates a collision cell with axial field gradient, Generation II ion optics, Trap HCD fragmentation, and a high dynamic range of detection for enhanced quantification. Thermo optimized the features of the Velos Pro for metabolite identification and peptide sequencing applications. The new Orbitrap Elite Quantum offers resolution greater than 240K FWHM at m/z 400 and four times the scan speed of the Velos model. It can perform parallel MS and MSn analysis and was designed to yield maximal protein identification for omics research. The Orbitrap Q Exactive™ is a quadrupole LC/MS/MS system with the quadrupole positioned in front of the Orbitrap. It offers protein identification, quantification, and confirmation at high resolution in a single analytical run, according to the company. The maximum scan speed is 12 Hz, resolving power is up to 140,000 FWHM, and the system features an intra-scan dynamic range greater than 5,000:1. Thermo also introduced the EASY-nLC 1000 split-free nano-flow UHPLC system that includes 50 µm UHPLC columns packed with 1.9 µm beads. AB Sciex launched its SelexION™ technology for quantitative and qualitative analysis using differential ion mobility spectrometry (DMS). It can be used for multiple reaction monitoring (MRM), with 25 ms cycle times per MRM. Designed to enhance selectivity to facilitate applications requiring separation of isobaric species, isolation of co-eluting contaminants, and elimination of high background noise, the technology can improve data quality and accelerate sample preparation, according to the company. The additional level of selectivity is based on the shape of a molecule. The DMS technology is compatible with AB Sciex’ TripleQuad™ 500 System and QTRAP® 5500 System mass spectrometers. The company also introduced SWATH™ Acquisition, a new MS-based technique designed to yield quantitative results for every peptide in a proteomics sample analysis. As part of its MRMAtlas collaboration with ETH Zurich’s Ruedi Aebersold, AB Sciex is developing MZS/MSALL functionality to enable SWATH Acquisition on its TripleTOF™ 5600 system. AB Sciex’ SelexION™ technology device is an ion mobility spectrometry tool for improving data quality in the quantitation and characterization of challenging samples. 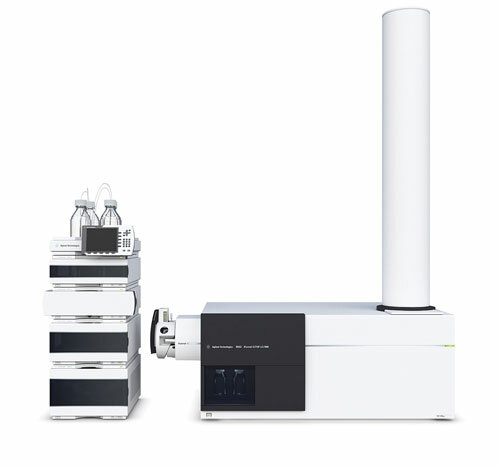 Agilent Technologies introduced the 6550 iFunnel quadrupole time-of-flight (Q-TOF) LC/MS system, which offers low femtogram sensitivity, acquisition rates up to 50 spectra/sec, and up to five orders of intra-scan dynamic range. The company’s new 6420 triple quadrupole LC/MS replaces the 6410 model and is designed to be readily upgradable to offer the twofold greater sensitivity of the 6430 and the eightfold greater sensitivity of the 6460. Agilent also highlighted its new Mass-Hunter software, which includes a translator system for transferring data into MassHunter. Waters introduced the Synapt® G2-S mass spectrometer at the ASMS conference. The G2-S is reportedly 30 times more sensitive than the Synapt G2, providing improved signal intensity and a five times increase in signal-to-noise ratio and tenfold enhanced limit of quantitation. The instrument combines Waters’ StepWave™ ion transfer optics and Triwave® ion mobility technologies; ions are separated based on size, shape, and charge before they undergo mass analysis. The advantage for drug discovery is that two proteins with an identical mass but different shapes—perhaps because one failed to fold properly—can be distinguished from each other, according to the company. Improper folding may mean the difference between a therapeutic effect and toxicity. 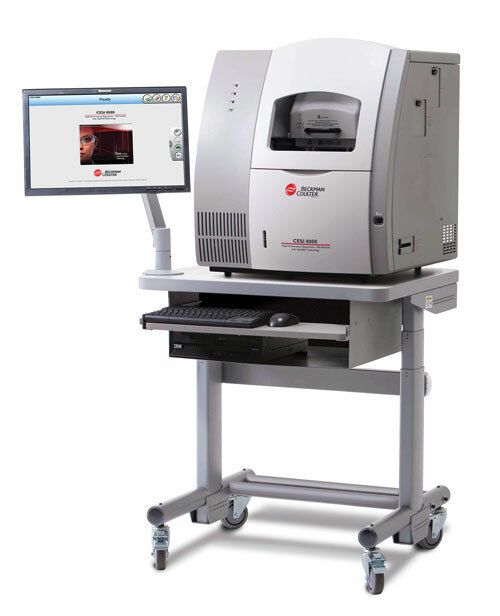 The G2-S supports Waters’ High-Definition MSE acquisition method. Waters’ Acquity UPLC I class offers 50% lower dispersion (reducing injection-to-injection carryover), nearly double the peak capacity, higher resolution, and faster run-times than the Acquity H series. Also newly introduced by Waters at ASMS was the Xevo® TQD tandem quadrupole mass detector, which has the same universal ion source architecture as the Synapt G2-S, as well as ZSpray™ and the company’s Radar ™ data-acquisition technology. Agilent Technologies’ 6500 iFunnel Q-TOF LC/MS reportedly provides superior sensitivity and data quality for profiling, identifying, characterizing, and quantifying compounds. 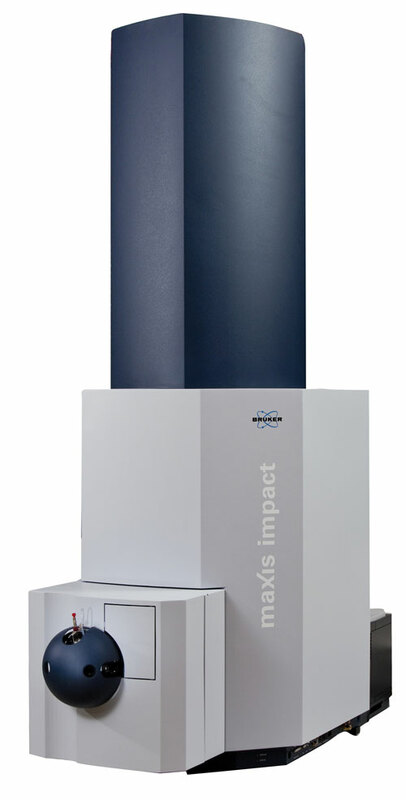 Bruker Daltonics introduced the benchtop maXis impact™ UHR-TOF MS, with >40,000 FWHM resolution, MS and MS/MS accuracy <1 ppm, ultrahigh pressure LC compatibility, and an acquisition rate of up to 50 full spectra/sec. The company’s new CaptiveSpray™ LC/MS source combines nanospray sensitivity with the ease of use of electrospray technology and is compatible with 50–5,000 nL/min LC flow rates. The source fits all current Bruker ESI/MS systems. The CaptiveSpray incorporates the company’s Etch Taper™ capillary spray tip, which creates a vortex around the spray that concentrates and targets the ions to the MS inlet. Shimadzu presented new applications for its ultrafast MS (UFMS) technology, made possible by coupling the company’s LC/MS-8030 triple quadrupole MS system to the Nexera UHPLC instrument at the front-end. The system offers sample injection as fast as seven seconds and repeatability of 0.5% in 1 µL injections. Shimadzu also introduced the SIL-30ACMP multiplate autosampler, designed for use with the Nexera UHPLC instrument. PerkinElmer launched the AxION™ mass spectrometry platform, which includes software for method selection and set-up, data management, and data analysis. 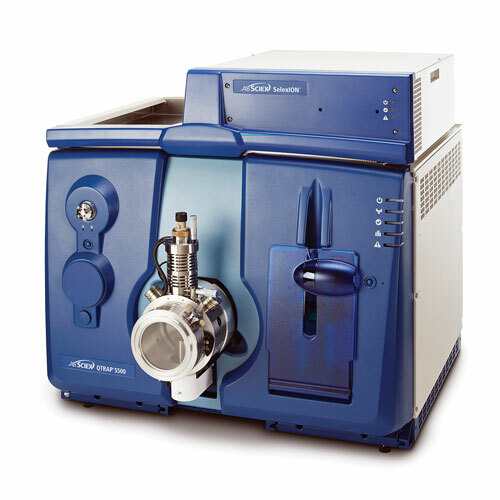 The system contains the AxION 2 Time-of-Flight (TOF)-MS instrument with an Ultraspray™ 2 ESI or Field-Free Atmospheric Pressure Chemical Ionization source. Each ion source comes with interchangeable snap-in probes for easy switching from user to user. The system has a mass range of 18–12,000 m/z, mass accuracy less than 2 ppm at 1,000 m/z, resolution of greater than 12,000 FWHM at 922 m/z, and a linear dynamic range of 105. According to Bruker Daltonics, the maXis™ UHR-TOF features mass accuracy and resolution enhancements, and significant sensitivity and speed. Beckman Coulter launched the CESI 8000 instrument, which combines capillary electrophoresis and electrospray ionization technology, at ASMS. The system is based on a new frontend separation and ionization technology called CESI, which integrates capillary electrophoresis with ESI in one device. It incorporates OptiMS technology and provides a peak capacity greater than 300. The nanoscale flow leads to reduced ion suppression and higher sensitivity according to the company. The Ionics 3Q Molecular Analyzer™ triple quadrupole MS system contains an interchangeable dual probe ESI/APCI source. Ionics collaborated on a poster with Hexagram Analytics that demonstrated efficient single injection analysis of a mixture of chemically diverse pesticides. In the method presented, the flow from the HPLC instrument was split into two flow streams, each providing continuous sample flow to each ion source. In this way users can rapidly switch from one to the other ion source during a single sample injection. A poster presentation by Bio-Rad Laboratories compared an in-gel proteolytic digest separation method using the company’s soon-to-be launched PROTEAN i12 isoelectric focusing instrument to conventional off-gel peptide fractionation methods. With in-gel separation the digest is incorporated into an immobilized pH gradient (IPG) gel by rehydration and is fractionated within the gel matrix. The results demonstrated a 20% increase in identifiable peptide and 14% greater protein identifications, as well as threefold faster separations (excluding elution time), as in-gel IEF can be run at higher voltages than off-gel IEF; however, in-gel methods require additional elution steps. The new instrument provides independent control of individual IEF strips, allowing users to employ more than one pH gradient or voltage setting and run multiple samples in a single experiment. The nanoLiter Cool Wave® induction-based dispenser shoots 100% of a nanoliter-scale liquid sample, as a droplet, into a TOF mass spectrometer, according to the company. The device can dispense into an ESI instrument or deposit a sample onto a MALDI source. Glygen collaborated on a poster at ASMS that illustrated the use of its Lab-in-a-Tip™ embedded micro-SPE cartridge technology (in the form of its PepTip™ pipette tips) for performing peptide synthesis, with a yield of about 10 nmol of peptide from each tip with up to 98% purity. Glygen also offers is micro-SPE technology in a microspin column format. Integration with an automated liquidhandling system allows for synthesis of 384 solubilized peptides at one time. Biotage recently introduced the Pressure+ 96 solid-phase extraction instrument, which processes 96-well plates, and the Pressure+ 48 for processing 48 SPE columns simultaneously. The units employ positive pressure to perform SPE in syringe-based cartridges for sample purification and enrichment upstream of LC-MS.
Sage-N-Research recently announced an agreement with the U.S. Army Edgewood Chemical Biological Center to commercialize a platform for rapid detection and identification of pathogenic microorganisms in fluids. The platform combines the Sage-N-Research Sorcerer™ computational analysis system and MS-based proteomics methods. Covaris is developing sample-preparation kits for proteins designed for use on its S220 system, developed initially for shearing DNA. The isothermal, noncontact sample-prep system utilizes adaptive focused acoustic technology, and all processing takes place in an enclosed vessel. Denator featured its new Stabilizor™ Peptide Extraction Kit at ASMS, designed for recovery of water-soluble endogenous peptides from tissue samples. Following heat stabilization to inactivate proteolytic enzymes, homogenization and filtration steps remove molecules greater than 10kDa in preparation for LC/MS analysis. The Genedata Expressionist® 7.0 for mass spectrometry is an enterprise software package for managing, analyzing, and visualizing MS data. Built on an open client-server architecture, the system integrates multiple proteomics and metabolomics workflows. The 7.0 supports MRM for proteomics. Other enhancements include unicode support of special characters and improved handling of multiplex experiments. CovalX has expanded its CRO services to offer epitope (linear or conformational) characterization using MALDI-MS for studying protein-protein interactions. Beckman Coulter’s CESI 8000 is based on a new front-end separation and ionization technology that fully integrates capillary electrophoresis (CE) with electrospray ionization (ESI) within the same device.